Last year, we predicted big things for tropical bathrooms and we certainly weren’t wrong! As with many contemporary interior design trends, blurring the boundaries between indoors and outdoors is an enduring theme. And, living in the UK, where it certainly isn’t always hot and humid, you may have to think creatively to replicate a tropical setting. What is the tropical look in 2019? Whilst last year’s tropical look was mainly focused around creating a lush, green paradise in which you can lose yourself for an hour or two, this year’s style has a more industrial, urban edge to it—perfect for city living. Rough brick walls, concrete effect walls, wood effect floors, weathered surfaces and black framed glass all combine with tropical plants to create a look that certainly wouldn’t feel out of place in the urban jungle. With more and more of us living in smaller dwellings such as flats or apartments, the result is fewer properties with gardens—which is another reason why plant life and greenery is so important in contemporary home interiors. When it comes to choosing plants for your bathroom, it’s not always easy to know where to begin. Think about your space and choose a mix of different species, from small pot plants, like cacti or spider plants, to more expansive plants that can be left to trail down walls. If you have the room to spare, why not add a large, floorstanding pot plant or even a living wall (which we’ll talk more about later in this article). Of course, not all pot plants are suitable for bathrooms, so you need to seek out those which thrive in the warm and often humid atmosphere. To help you on your way, see our recommendations below. Providing inspiration for your own tropical style bathroom, we’ve come up with the following 8 ideas. 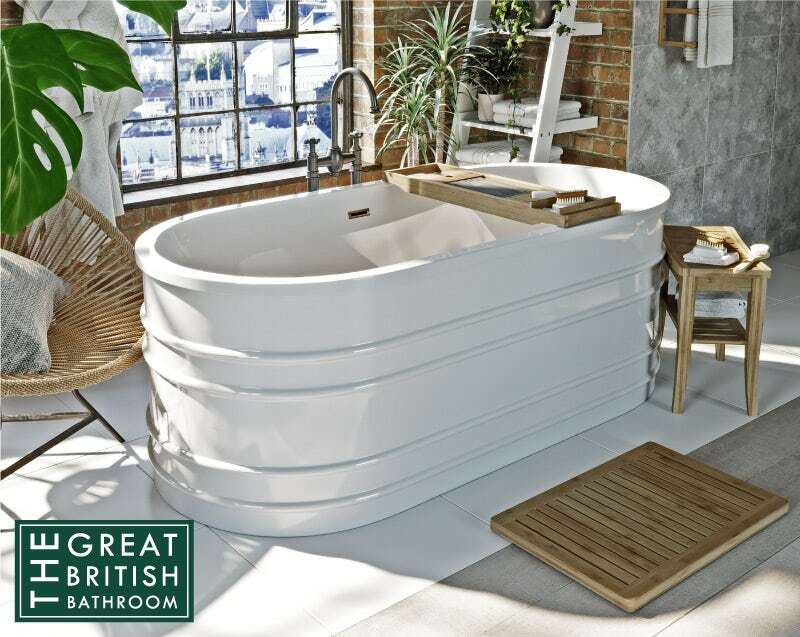 To set the scene, seek out an industrial style tub like the Hale freestanding bath (pictured below). With a design that intentionally gives a nod to tin baths of old, this design features a simple curved, contemporary shape and ridges which give it real character. Choose a more natural finish to your walls and floors, although you needn’t splash out thousands of pounds on authentic materials. You can easily recreate the look with materials such as vinyl or laminate flooring for wood effects, concrete effect wall panels or tiles and even faux brickwork wallpaper outside of your splash zones. Natural wall and floor finishes. Keep an eye out for different wall and floor options which promote a more organic look. Marble, stone, wood or brick effect tiles, wall panels or wallpaper (in non-splash zones) bring the look together. 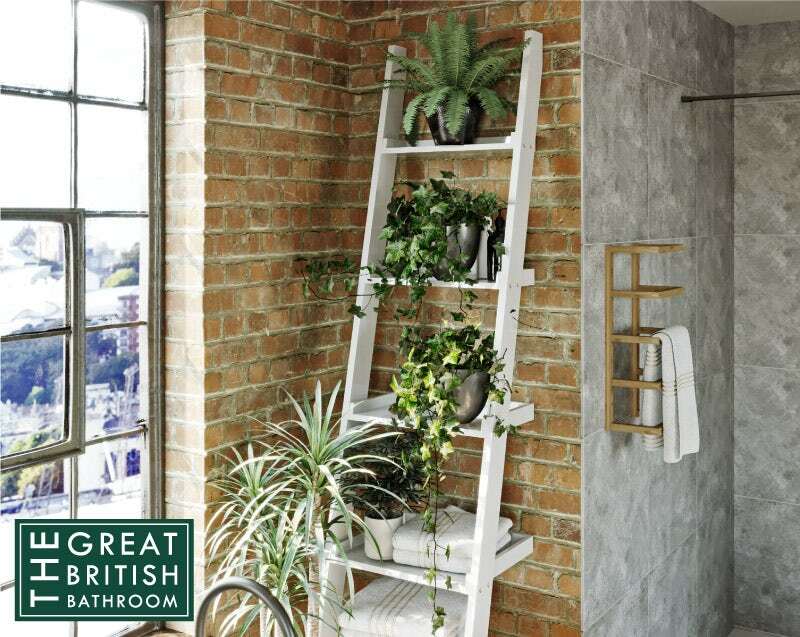 Ladder shelving is very on-trend and is the perfect place to display trailing plants, as well as adding valuable storage space for toiletries, towels and treasured possessions. The best place to display your pot plants and paraphernalia, ladder shelving is the next big way to store items. 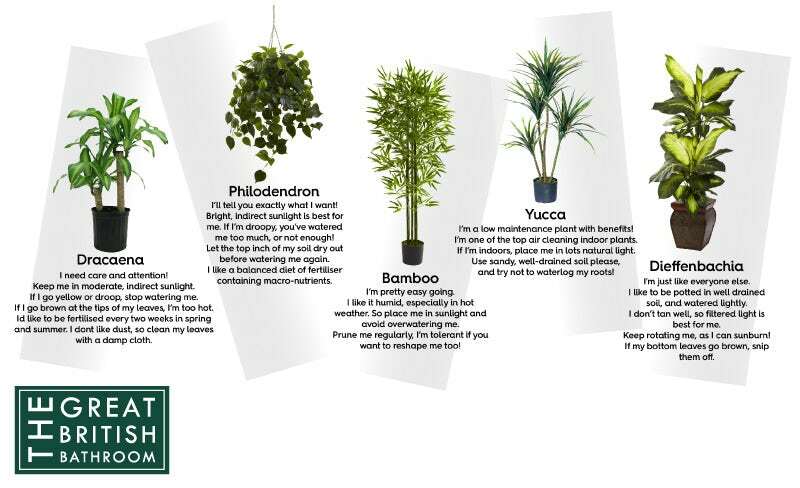 Ideal for trailing plants, it’ll maximise your space whilst looking effortlessly on-trend. A wet room with level access flooring is the ultimate when it comes to your own spa-like space. 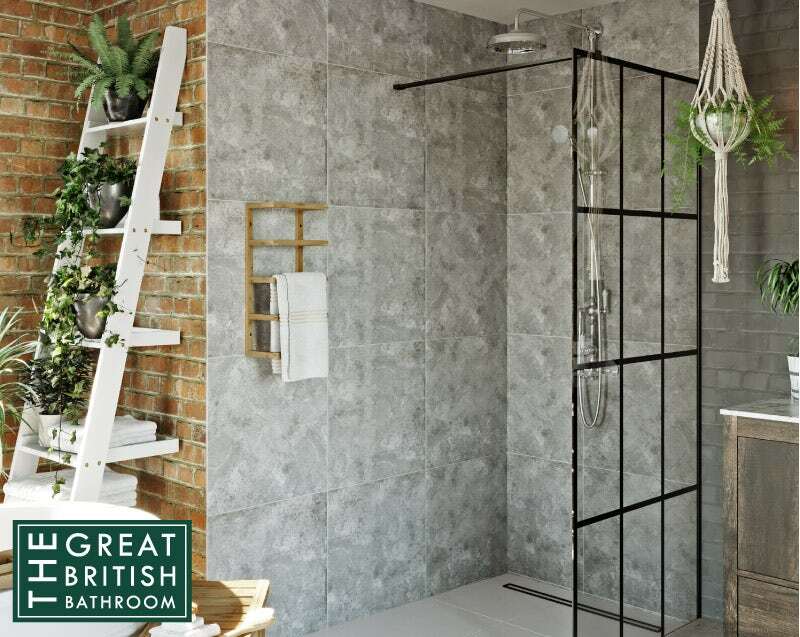 Add an urban touch with concrete effect tiles, a classic shower system with cross head handles and ceramic levers and, the final flourish, a black framed shower screen. To make the shower area feel more integrated into the bathroom design, use a walk in enclosure, or, better still, a wet room enclosure. The level access means you walk straight onto tiles and couple with a fashionable black-framed glass panel. Bringing a more organic feel to your bathroom, bamboo accessories, like the stool and towel holder above, are ideal. Plus, as bamboo is one of the most sustainable natural resources in the world, you’ll also be doing your bit for Mother Nature. If you feel like getting crafty, why not add more hanging space for plants by making your own macramé plant hanger? Find out how in my latest article, or watch the video below. When choosing furniture, seek out cabinets or vanity units with a more rustic appearance. 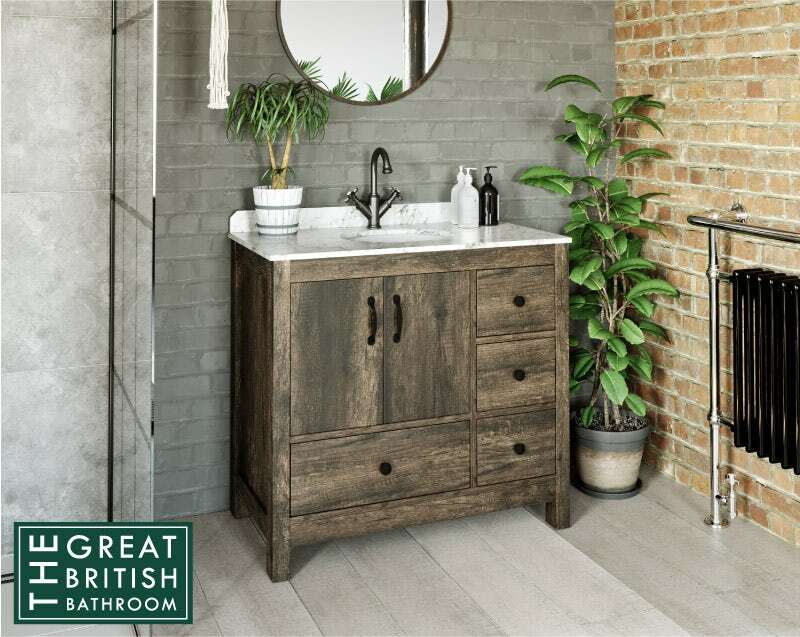 The Dalston floorstanding vanity unit and white marble basin 900mm (pictured below) is ideal, with a weathered appearance, plus a genuine marble basin and worktop which adds a touch of luxury. Of course, your bathroom isn’t likely to be as large as the one pictured above, which is why it’s good to explore options in an average-sized space. Below, you’ll find our take on this look. With many of us ditching the tub for a shower, we’ve simply followed suit and maintained the walk in enclosure for a more spacious feel. The vanity unit helps optimise storage, whilst a back to wall toilet uses a small bathroom space more efficiently, with the cistern concealed behind a false wall. 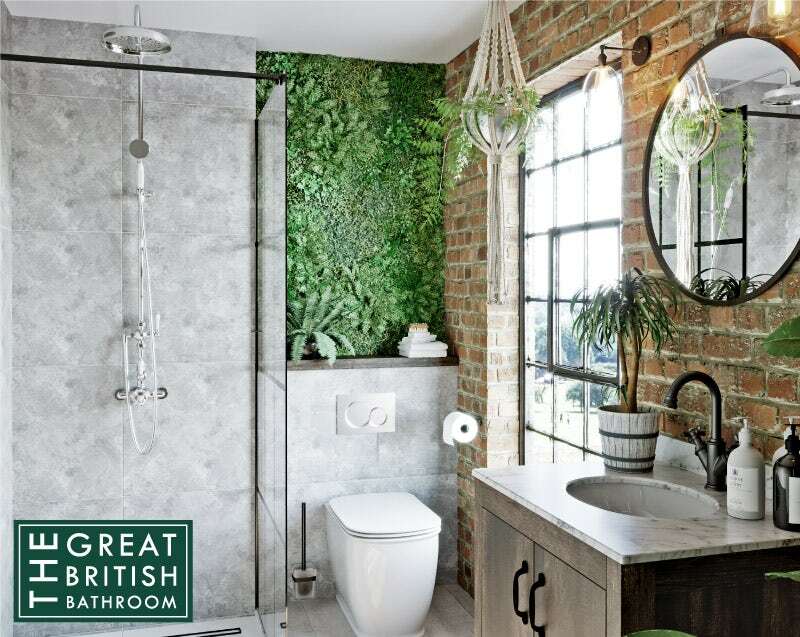 An amazing way to add a bold, green backdrop to your bathroom space is to create a living wall. This is ideal where you don’t have many surfaces upon which plants can be placed. Watch our video below to find out how to do it. 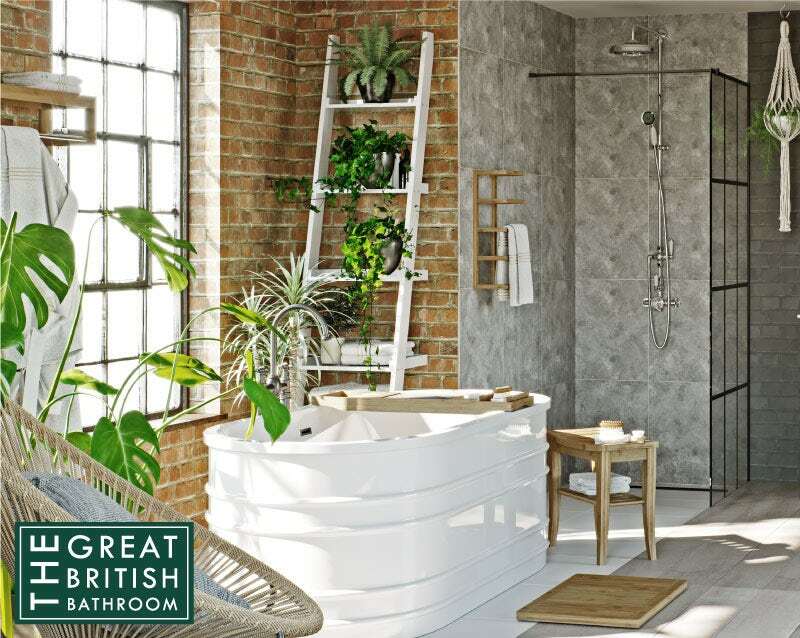 Every single week, we’ll be celebrating the Great British Bathroom with fresh bathroom ideas for you to try. Simply head to our bathroom ideas page to keep up to date. Let yourself be whisked away to the heart of the rainforest. Give your bathroom a hot tropical makeover!